Today I'm going to disclose a series of UI Redressing issues that could be exploited in order to extract information that may help an attacker to identify a victim-user whenever anonymity is a critical requirement. Moreover, a new extraction method, which has been successfully applied against Google Chrome, will be presented. Google's web browser disallows cross-origin drag&drop and what I'm introducing here is a completely different approach to achieve the extraction of potentially sensitive data. I found that several world-renowned web applications lack protection of web resources from UI Redressing attacks, thus revealing data that can be abused to disclose a user's identity. An identification attack could be successfully performed by exploiting a UI Redressing flaw affecting web resources that include, for example, the name or the e-mail address of the victim. Figure 1 - Google Support vulnerable to UI redressing attacks. Figure 2 - Microsoft Profile web resource vulnerable to UI Redressing attacks. Figure 3 - Yahoo! web resource vulnerable to UI Redressing attacks. The Google Chrome web browser seems to have defeated any extraction methods, denying the use of the view-source handler and disallowing cross-origin drag&drop. Despite these adverse conditions, I identified some attack scenarios where a UI Redressing issue could be still performed in order to extract sensitive data. Once again, the method is extremely simple. Instead of a cross-origin drag&drop, the victim is tricked to perform a same-origin action, where the dragged content belongs to a vulnerable web page of the targeted application and the "dropper" is a form (text area, input text field, etc.) located on the same domain. Using a site's functionality that allows publishing externally-facing content, it is still possible to extract information. Under these circumstances, Chrome will not reasonably deny the same-origin drag&drop, thus inducing the victim to involuntary publish sensitive data. As a matter of fact, the attacker is exploiting a subsequent clickjacking vulnerability on the same domain, which causes the publication of the personal information. I refer to this kind of attack chain as a "bridge" that allows the attacker to move sensitive data from being private to public, while remaining on the same domain. Then, the attacker can simply access the (now) public information to obtain the extracted data. It should be outlined that the technique requires two vulnerabilities: a web resources that is not protected by the X-Frame-Options (or uses a weak frame-busting code) and a site's functionality that is affected by clickjacking. At that point the attacker can access all personal details by simply visualizing the submitted comment of the Amazon's item. In the previous post, a new cross-domain extraction method - affecting the latest version of the Mozilla Firefox browser - has been presented. The iframe-to-iframe technique was successfully used in a UI Redressing attack affecting LinkedIn. Today, I'm introducing an instance of the aforementioned method that involves a known Apache Web Server security issue, in order to steal session cookies that are protected by HttpOnly flag, thus allowing the attacker to perform Session Hijacking attacks. A new attack targeting PayPal systems will be also presented. Bypassing HttpOnly flag if a XSS vulnerability is found on any subdomains of the host that is affected by the Apache disclosure issue, if exploited in conjunction with a UI Redressing attack - that allows the cross-domain content extraction of the information included in the triggered Apache error message. It should also be noted that the Apache Web Server is often used as a reverse proxy configuration. As a result, any session object on any server-side technology, could be attacked with the described vectors. During my security research on UI Redressing attacks I found multiple PayPal subdomains (e.g. https://b.stats.paypal.com) affected by the Apache disclosure bug as detailed in Figure 1 and Figure 2. Figure 1 - HTTP request with the overlong cookie. Figure 2 - Apache error message with the disclosure of the malformed Cookie header. Despite in the first instance the bug could appear as useless, I found that the PayPal application - www.paypal.com - delivers the session cookies defining the domain to .paypal.com (Figure 3 and Figure 4). Figure 3 - Post-authentication cookies delivery. Figure 4 - Cookies delivered to the personal.paypal.com subdomain. As detailed in Figure 5, the navigation of the above URL involves the setting of the cookie named navcmd and then a bit of client-side black magic defines two new cookie fields named s_sess and s_pers (Figure 6) that complete the desiderated malformed HTTP request. Figure 5 - Cookie defined with attacker-controlled input. Figure 6 - Final monster cookie. The malicious page allows the victim to play the d&d game with the extraction of the secret session cookies. Figure 7 - Pop-under page with the navigation of the monster cookie's generation URL. In the past weeks I worked on UI Redressing exploitation methods. The UI Redressing Mayhem series is going to illustrate the results of my research, presenting 0day exploiting techniques and several vulnerabilities that involve high-profile web applications. Each post of the series will also provide detailed information about the vulnerabilities and techniques, together with working Proof-of-Concept exploits. The following article will detail a previously unknown Mozilla Firefox vulnerability that affects the latest version (v.17.0.1) of the Mozilla web browser and allows malicious users to perform cross-domain extraction of sensitive data via UI Redressing vectors. My security research on UI Redressing exploitation techniques grounds its roots in a web application penetration test where I was asked to exploit a UI Redressing bug with the explicit constraints to target Mozilla Firefox users. My objective was to achieve the cross-domain content extraction of an anti-CSRF token, in order to trigger the update of the victim's profile e-mail address: the powerful double drag&drop method was found to be appropriate in that context. To the best of my knowledge, the method was first introduced by Ahamed Nafeez and is based on the possibility to perform a drag&drop action between a framed web page, which displays the "sensitive" contents and is not protected by the X-Frame-Options header, and the framing page (the "dropper" page), which receives and stores the extracted content. The view-source handler is used here to bypass any framebusting code. The main problem with my exploit development, during the penetration test, was that the drag&drop method was recently killed by Mozilla. An interesting solution to the Mozilla fix is the fake CAPTCHA method that was introduced by Krzysztof Kotowicz — and demonstrated to be effective against Facebook and Google eBookstore — but I chose the hard way and tried to bring the drag&drop method back to the masses: so please welcome the iframe-to-iframe cross-domain extraction method. The extraction method is extremely simple: instead of performing a drag&drop action of sensitive data, from a framed vulnerable web page to the framing one (attacker-controlled), the victim is tricked to visit a malicious html page that includes two iframes: the vulnerable page - where the sensitive content resides - and another attacker's page that is used to drop the extracted content (Figure 1). Firefox is not able to block this kind of attack because no check on cross-domain drag&drop between iframes is performed. As mentioned before, the method was tested against Mozilla Firefox version 17.0.1 - the latest stable release at the time of writing. The iframe-to-iframe technique was also tested against Google Chrome but the browser has been proved robust to the proposed attack. Figure 1 - iframe-to-iframe d&d extraction method. The iframe-to-iframe method re-introduces the possibility to abuse the Firefox drag&drop mechanism to perform a cross-domain data extraction. Let me now introduce an high-profile vulnerability and attack that targets the LinkedIn application implementing the proposed method. LinkedIn implements a stateless anti-CSRF mechanism that associates tokens to the HTTP requests that result in a change of the remote application state, such as the update of a user's profile information (e.g. job title or the login e-mail address). A stateless anti-CSRF method is generally based on a secret token, delivered as a cookie parameter, and a token which is included in every state-changing HTTP request: the remote web application considers as genuine exclusively the HTTP requests that have the same token value for both the cookie and HTTP parameter. Otherwise, a request is considered untrusted and it is not computed. The LinkedIn's anti-CSRF mechanism involves a cookie parameter called JSESSIONID and an HTTP parameter named csrfToken in order to store the secret tokens (Figure 2). A stateless mechanism can be easily bypassed with well known web hacking techniques. Figure 2 - anti-CSRF tokens. Figure 3 - Vulnerable LinkedIn web resource. The vulnerability can be easily abused to craft a UI Redressing exploit that triggers the victim to drag&drop the anti-CSRF token. The token can then be abused to edit any information on the victim's profile and even to reset the account password. In order to demonstrate the effectiveness of the attack I developed a fully working Proof of Concept exploit that adds the attacker's e-mail as a trusted address to the victim's profile and verifies the e-mail itself. At that point, the attacker can easily reset the victim's password using LinkedIn password reset mechanism. The script can now simulate the navigation of the fetched URL in order to confirm the new address. The attacker can now reset the victim's account password abusing the password reset functionality, where he will type the e-mail address previously added to the targeted profile. 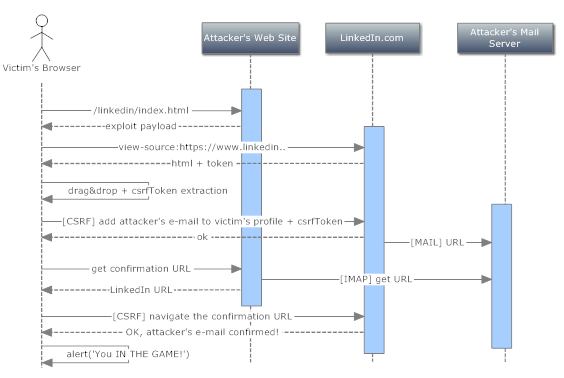 Figure 4 highlights the different HTTP requests exchanged between the attacked web browser, the attacker's servers and the LinkedIn web application, in order to achieve the password resetting. Figure 4 - Sequence diagram detailing the attack. Consider to adopt a stateful anti-CSRF mechanism that should not perform the validation on the basis of potentially attacker-controlled inputs.